Teds parents have a timeshare at Snowbird Ski Resort. So Ted and I took the kids on Saturday night and came home Sunday night. On the way up we stopped at Chin Wah one of our favorite Chinese restaurants. Sunday we missed church again :-( haven't been in 3 weeks! Braking the sabbath can be lots of fun..We went to lunch at the Forklift which is a restaurant at the resort. Then we took the ski tram up to the summit. Daesha liked going up higher and higher while Keegan kept crying. I think his ears were popping because mine sure were. Daesha had a blast swimming in the heated outdoor pool. And of course Daesha got her little following of "fans" every where she went. I was out side with her while she was in the pool on Sunday and I hear 3 girls yelling, "Daesha, Hi Daesha" from their balcony about 6 floors up. I asked her who those girls were and she replied, "oh, just some girls I met yesterday". What a Diva. It was great weather, not much snow but it was a nice little getaway. Oh I almost forgot to post about our vehicle we bought last weekend. 2002 Chevy Suburban. LOVE IT. It has all the extra's.. DVD, onstar, leather seats, sunroof, and space!!!! Ted drove all weekend. Now we can look normal instead of me driving the Jetta and Ted crunched in the passenger seat. You bought it!!!! How fun! But can I call you a bus driver now?!? I miss snowbird, I am very jealous! congrats on the ride!! 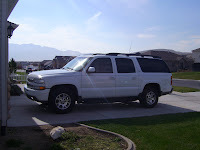 i have a tahoe, white and looks just like yours but shorter! we are semi-twinkies now! i love mine too! go us!